The night before Christmas, the husband informed me that the turkey was off. Cue mild panic that we may be having beans on toast for lunch after all. 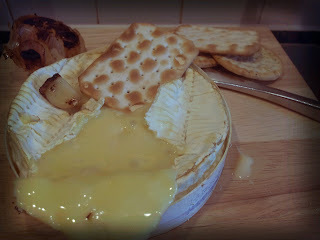 But on excavating the mountains of food I'd purchased (that subsequently went uneaten) it turned out to be the Camembert that I'd purchased to do Paul Hollywood's brioche wrapped Camembert - it should've been Brie, but Sainsburys were all out of whole one. Said cheese then had to be wrapped in several plastic bags before being sealed into a Tupperware box because the smell offended the husband's sensitivities. Of course, with all the other non-eating going on due to several unwell people, the cheese was forgotten until last night. Hmmm... What to do with it? There would be no chance of the husband eating it and the eight-hour recipe that is the Silver Fox's baked Brie just seemed too much effort for one person so, having reorganised some of my most favoured cookbooks on to the book case in the lounge, I leafed through them seeking inspiration. Lorraine Pascale's Baking Made Easy had the answer. I remember her baking this one on her show, and thinking at the time that I didn't really consider shoving a cheese in a box in the oven to be baking. But hey, I had cheese to eat so I might as well give it a go (and her deep fried Camembert from Home Cooking Made Easy seemed far too decadent). I bought the book for a fiver when the Book People were at work but it's another one that's had little use. Having leafed through it again, I will definitely make an effort to use it more over the remaining eight and a bit months of this blog. I bought it for the recipe for Mojitos Genoise which looked amazing (and was then published in BBC Good Food anyway). I've made the Oreo Brownies which went down a storm with the recipients and I'm pleased to see a recipe for mini Croquembouche which I will be making for me and the husband on New Year's Eve - because I've got half a litre of double cream to use up. The recipe was really easy. I know from researching other similar recipes that you need to make sure your cheese box is stapled rather than glued or it will fall apart in the oven (solve this issue by tying string around the middle). I had planned to make a Pain d'Epi from Easy Home Cooking to go with it, but in the spirit of recycling, ate it with some of the crackers left over in the Christmas tin (there was only one missing - why on earth did I bother buying them). But any crunchy bread-related things will do for dipping. Do watch the oven temperature though because my honey burnt and made the top of the garlic burnt, however it was still really tasty and the flavours from the herbs with the honey made the roasted garlic beautifully sweet. I must go and swig some mouthwash before I venture out again. Place the garlic cut side down in a large roasting tin. Add the butter, oil, a pinch of salt, a couple of twists of black pepper, the honey, rosemary and bay leaves and bake in the oven for 40-45 mins. After 30-35 mins put a large cross in the top of the Camembert and add it to the oven. Add the French baguette to warm up too. Serve everything on a big sharing plate. Break off a piece of crusty bread, squeeze out the tender flesh of the garlic along with a healthy dose of cheese and smear it liberally over the bread.